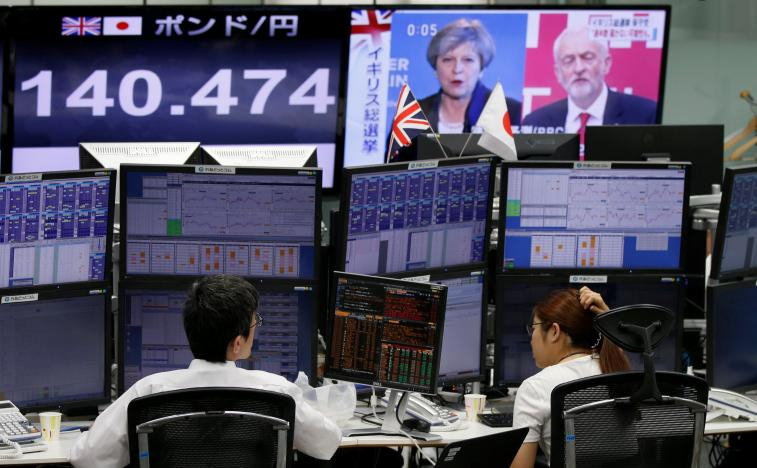 Sterling slumped in Asia on Friday as British elections seemed to leave no single party with a clear claim to power, sideswiping investors who had already weathered major risk events in the United States and Europe. The shock outcome saw the pound shed as much as three US cents at one point, or close to 2 percent, on fears that it would plunge domestic politics into turmoil and delay Brexit talks. Futures for the FTSE eased 0.2 percent, while yields on 10-year gilts dipped 3 basis points to 1.00 percent. The damage was limited elsewhere, with E-mini futures for the S&P 500 ESc1 0.1 percent firmer. Japan's Nikkei added 0.7 percent and MSCI's broadest index of Asia-Pacific shares outside Japan inched up 0.2 percent. "This is messy for the UK economy and its Brexit negotiations and hence is a negative for the pound and share market," said Shane Oliver, chief economist at AMP. "But the UK is just 2.5 percent of world GDP and it's hard to see significant implications for global investment markets." The rot started when an exit poll showed Prime Minister Theresa May's Conservative Party could fail to win a clear majority. With over half the seats counted, the results showed a large swing to the opposition Labour Party, with the BBC forecasting the Conservatives would hold a reduced 318 seats in the 650-member parliament. For the latest updates, click. Markets had assumed May would easily increase her majority and betting agencies were taking wagers on whether she would lose her job. "We could be heading for a period of market uncertainty, which will be compounded by the elephant in the room this time around -- the forthcoming Brexit negotiations," said Michael Judge, head of corporate dealing at broker OFX. "Investment decisions are likely to be put on hold for the short to medium term -- certainly until we have clarity on who governs the UK. At that moment, that is anybody’s guess." By 0400 GMT sterling (8am in Dubai) had shed 1.6 percent to $1.2750, having earlier carved out a two-month trough of $1.2693. It was also down 1.4 percent on the euro at 87.80 pence. The Japanese yen gave up early gains to ease to 110.30 per dollar. The euro had less luck against the US dollar, easing 0.1 percent to $1.1199. The single currency had slipped overnight when the European Central Bank cut forecasts for inflation and said it had not discussed scaling back its massive bond-buying campaign, sending bond yields to multi-month lows. Overnight, Wall Street had seemingly judged the testimony of former FBI director James Comey was not life-threatening to the administration of President Donald Trump. Comey accused Trump of firing him to try to undermine the investigation into possible collusion by his campaign team with Russia's alleged efforts to influence the 2016 election. "I think the market is taking less of an alarmist review of this situation because there is no smoking gun here," said Jefferies & Co money market economist Thomas Simons. "So it's not particularly impactful for thinking about... Trump's economic agenda to go through." The Dow rose 0.04 percent, while the S&P 500 gained 0.03 percent and the Nasdaq Composite 0.39 percent. In commodity markets, spot gold was 0.3 percent lower at $1,274.30 an ounce. Oil prices remained subdued with Brent having settled at its lowest since Nov. 29, the eve of an OPEC production cut deal. US crude futures edged down 3 cents to $45.61 a barrel, with Brent crude easing 4 cents to $47.82.